Writer and Director, Louis Mansfield, and Producer Chrissy McDermott team up with Illustrator, Mike Wohlberg and Animator, Jason Melcher, to tell the story of an old man reminiscing of a life he never had until he meets a French woman who helps him bring his dreams come true in their short: Wine, Women & Cognac. Today, they are working on turning their short into a feature Old Man In France and more with their production company FFR (Federal Film Reserve). Old Man In France is a story of a grumpy old man at odds with his retirement home pretends to have been a gentleman of international success. When a beautiful French woman moves in, he finds a new opportunity for love, adventure, and companionship. We met on a micro-budget feature film that Louis wrote and directed, Birth Of Separation. I was working as the camera assistant on the film. After the shoot had wrapped, a group of us from the production stayed close friends and continued to work on other projects together. After the feature, Louis wanted to start directing short films while developing a second feature film with a larger budget, at which point he asked if I’d be interested in trying my hand at producing. I was very eager to get more involved with independent productions, particularly with pre-production and development, so I jumped at the opportunity. We’ve been working together as a producing/directing team ever since. Louis: I grew up bouncing around military bases and was involved in promoting and playing music in his early to mid-twenties. He decided to focus on film when he realized that he had the resources to make a feature film with a small budget like he had always wanted. Chrissy: I began my career in filmmaking while at Temple University when I started working as an assistant camera on a variety of productions throughout the North East. After working on my first feature in 2009, I began producing short films working with Louis. At that point, I made the switch to producing and have loved the chaotic challenges of running a film production. Currently we’re developing two features, one live action film, Old Man In France, and one animated film, The Death Of The Boogeyman. What made you want to get into animation? Chrissy: Louis wrote a feature film script, Old Man in France, and we thought that since the beginning of a script should really pull the reader into the story, we would animate the first ten pages into a short film to communicate the wit and charm of Old Man in France. With the help of Jason Melcher’s animation and Mike Wohlberg’s illustration, we were able to bring the beginning of Old Man in France alive in our short film, Wine, Women, & Cognac. The short has been a great tool when presenting the film to potential financiers and production companies. We’ve received some really positive feedback about the style and the endearing nature of the story. What was the short that brought you to HollyShorts? Chrissy: We were first brought to HollyShorts with our short film, Whom God Helps, which is an unconventional supernatural/horror film with lots of practical make-up FX. The film screened in a cinematography block and was a great experience. The thing that really got us excited beyond the screenings, however, were the panel discussions. We literally were being informed of the ways digital distribution platforms would be changing the film industry several years before it happened. Thinking back, every panel we went to we were given valuable insight and advice. The one piece of information that stuck with us the most was that film financing is not an exact science and that we need to approach funding from several different avenues. This was one of the reasons we decided to make a short for feature film in the first place and it has been a key element of our film’s pitch package. What made you want to tell the story of the old man? Louis: I wrote Old Man in France in a time where a lot of things seemed uncertain. I didn’t know if I’d be able to make feature film with a respectable budget, I didn’t think I’d ever be able to live in another country, and I wasn’t sure if filmmaking didn’t work out that I’d live a happy life. There are clearly more serious issues to have but when you’re working years towards a goal that seems to become further and further away some introspection is almost mandatory. I thought about all of those things quite a bit until one day I imagined an old man who regretted never accomplishing the things he had wanted to do. An old man who instead of pursuing at least some of the things later in life just bitterly shut himself off from the outside world and lived in a fantasy where he had traveled to far off lands living an overindulgent lifestyle. I’m fairly modest so that aspect was a fun embellishment. I also thought of the people that he would interact with many of them not liking him very much as he is quite grumpy. He would have only one friend who happened to be a young British man who worked at the retirement home and had traveled all over Europe. After creating these ideas the only other thought was to turn this old man’s life upside down with a new resident in the retirement home who happened to be a lovely elderly French woman who lived the life the old man had always desired. After representing himself as a man of international success his two worlds of wonderful fantasy and disappointing reality collide. The biggest and best thing Chrissy has ever done for me is encourage the writing of Old Man in France. I think she recognized that it was not only a project to work on together but was also a cathartic light at the end of a tunnel in an uncertain time. All in all, I think what made me want to tell a story about an old man is that I wanted to give myself hope that while I may not experience life in my ideal way that with love and friendship happiness isn’t very far away. What is next for you two? We’ve been developing the feature for about two and a half years now and are currently seeking funding and talent. About a year ago we partnered with a young, ambitious independent production company based in LA, Buffalo 8, whom we’ve been working with to package the film. Buffalo 8’s key role is to connect us with potential financiers, sales companies, and talent agents. Currently, we have Evan Jonigkeit (X-Men: Days of Futures Past) and George Newton (Paddington) attached and we’re speaking with a few sales and production companies. We’re also in the early stage development for another feature, Death Of The Boogeyman, which is an animated children’s horror film comparable to ParaNorman and the children’s television series, Foster’s Home For Imaginary Friends. 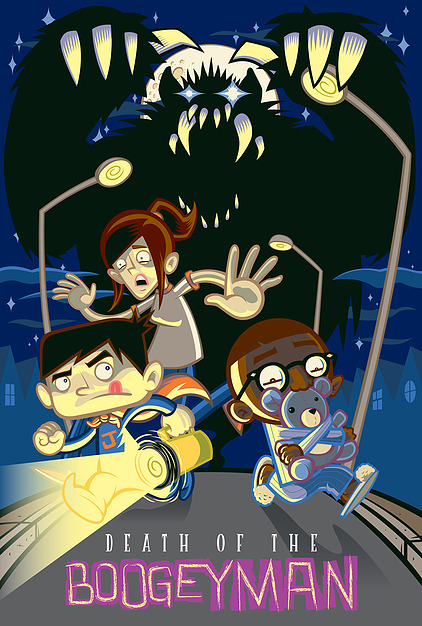 Death Of The Boogeyman is a story of an adventurous little boy, his naive big sister, and precarious best friend who are on the run from a ferocious boogeyman after an innocent prank goes horribly wrong. Our production company, The FFR, also completed production on our most recent short film, a live action and animated comedy called The Proper Etiquette For Being Alone. For the film, we handcrafted eight large, wearable bobble heads during the three months of pre-production and shot the film over the course of four days. The bobble heads worn by actors and shot with only tracking markers on the faces which will have animated facial features added in post production. We started post in April and plan for another festival run for this short in 2016. What is your advice on collaborating together? When collaborating don’t forget to have fun and laugh together. Laugh as much as possible and I mean big loud laughs that would make people in a movie theater annoyed. Care and love what you’re doing and be the person the other can lean on in times of need. Sometimes it’s easy to forget that a lot and that’s when things can become stressful. When working on any team, make your goal to be a utilitarian, invaluable team member. Not only will that help you get the best, most fulfilling experience from any collaboration or production but you’ll likely in turn have that support when you need it. While we believe having a protocol and a structured way of making movies together is essential, the biggest and best thing we can do for our fellow filmmakers is encourage them. Any advice to your fellow filmmakers? We’ve noticed that getting our assets together like budget, proposal, script, breakdown, schedule, etc. has definitely helped communicate our film in financial and creative ways. With all of our package materials well prepared, we were able to partner with a production company which has granted us access to resources me might not have had on our own. We’ve be fortunate to have worked with Buffalo 8 Productions and as a result, have had our film put in front of potential financiers, production and sales companies, and agents. Making our short film, Wine, Women, & Cognac, as a visual representation of our feature film has enticed potential investors and gained a good amount of positive attention for our project as well. We haven’t found our perfect financing match yet, but it’s been great to receive positive feedback on our short and the business proposal. We’ve also learned the value of having video content to supplement our film package, specifically a short or trailer for feature. Wine, Women, & Cognac is a short that’s an adaption of the first ten pages of the feature script which was created by animating the storyboard illustrated panels.